Want to make a gorgeous baby hair clip? 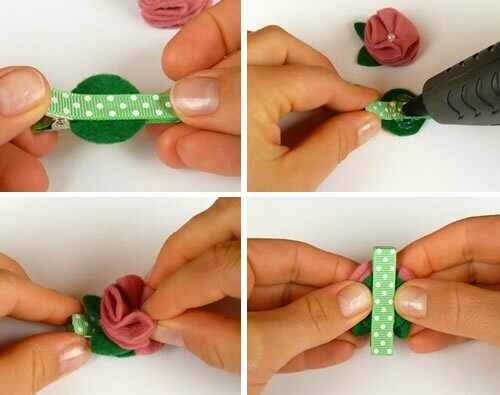 Little girls look so sweet with flowers and bows in their hair, and it is very easy to make your own hair clips rather than buy them in a store. You can also make them in bulk, so it's really convenient if you need several new baby or toddler birthday gifts! I know it seems strange to have a section on safety before I even start the tutorial, but as these gifts are made for babies and toddlers who like to put *everything* in their mouths, I thought I would just quickly address a few concerns I have over some of the tutorials out there for making hair clips. It can be a challenge to get some types of ribbon (such as the popular grograin ribbon) to adhere to an alligator clip. Many people use hot glue, but I've found that the ribbon peels off from the clip at a simple tug. I've also found that securing a little flower or other embellishment directly on the ribbon with hot glue doesn't always work and they can be pulled off quite easily depending on the types of materials involved. Usually a weaker bond wouldn't matter so much for an adult (as we know not to play with the embellishment! ), but you don't want your hair clip to come apart when baby first plays with it and present a choking hazard! Don't get me wrong, hot glue is great and works really well for sticking felt-to-felt and lots of other craft stuff, but just isn't great for these ribbons and clips. So read below for my tips and tricks for how to make a more secure handmade baby hair clip, and always test your finished product just to make sure it isn't going to fall apart before you present it as a gift. craft ribbon as wide as your clip and about 4 times as long as your clip. I use Grosgrain Ribbon as it comes in such sweet colours and patterns. Of all the tapes and glues I've tried, Fillet tape is THE BEST! It is a double-sided tape used in picture framing, and can apparently adhere plastics, wood, fabric or metal together. It bonds instantly, but cures fully in 24 hours so the bond gets even stronger. The acryclic adhesive is archival quality so it won't dry out or go yellow. I discovered it when trying to make these hair clips and have found that it is a great item to have in my stash as it is SO useful for many different crafting needs! And best of all you can order it on Amazon now so you'll be able to get it posted to your door! 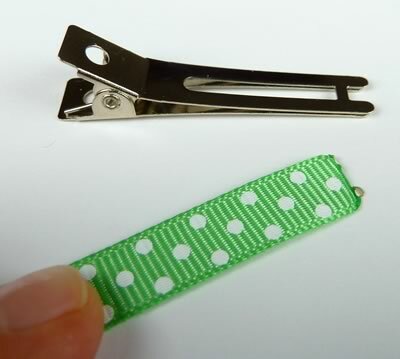 First thing you'll need to do is measure out and cut the right length of ribbon to cover your clip. I like to cover the clip completely as I think it is more comfortable for the little ones and helps the clip to stay in their fine hair. Plus it is harder for their fingers to find the end of the ribbon to peel it off if it is hidden on the inside surface of the clip. Clasp one end of your ribbon inside the clip, and then loop the loose end of the ribbon around the outside of the clip and back over the top surface. Cut off the desired length. At this stage I like to measure the length of ribbon so that it is much easier to simply measure and cut for the next clip I cover. Melt each end of the ribbon slightly to prevent any unfurling by putting the end of the ribbon next to an open flame from a match, lighter or your stove top. Place a strip of double-sided tape on the inside surface of the ribbon. Don't remove the backing strip just yet! I find it easiest to remove the backing in stages. The tape is so adhesive that it will stick the ribbon to you or itself and you'll end up in a tangle! So, remove just enough of the backing to adhere the ribbon to the inside surface of the clip. Keep the clip open and press down firmly to secure the ribbon in place. Working in stages, cover the entire clip with ribbon. Make sure you press the ribbon into the gap near the hinge. When you get to the final stage, keep the clip open and gently roll the ribbon into place and press down firmly to secure. While you've got your materials out, why not make a whole batch of handmade baby hair clips which you can then embellish with buttons and flowers! 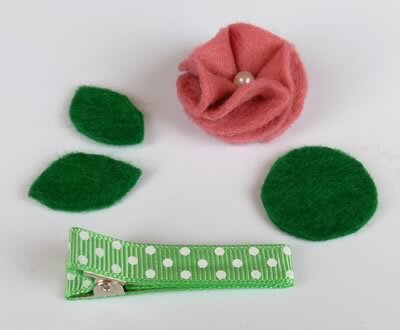 For this baby hair clip I made my own little felt flower embellishment which I'll describe below, but you can either make your own or purchase a small flower. Or why not make a little some holly leaves with red beads for berries for a Christmas-themed clip? This is where the fun begins! I came across the most gorgeous baby headband flower tutorial here , which I modified to suit my purpose. I used 5 circles of felt rather than 4 when making the actual flower to obtain a fuller flower look (I think I have a thinner felt than what she has used so my flower wasn't as perky). I used a smaller circle size, and didn't cut any special edging. I sewed the felt petals together without using a spare flat circle as a base. Fold each felt circle in half, and then layer each of them over the previous petal at an angle, tucking the final petal underneath the first petal (look at the tutorial to see what I mean - she describes it as similar to a "box fold"). At this stage you can rearrange the petals slightly to make sure they are evenly spaced. 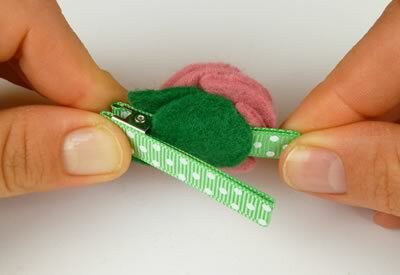 Then sew the petals in place with a few small stiches. 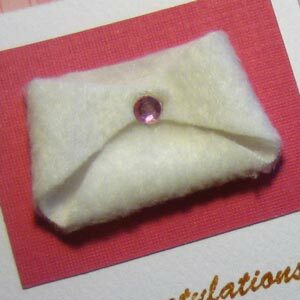 Sew in a pearl or other bead center. I decided to add a few green-felt leaves to my flower. 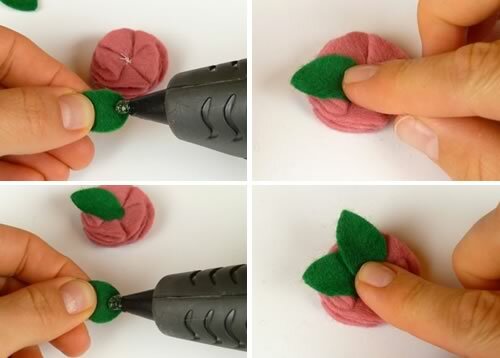 Cut out leaves of an appropriate size and attach with dabs of hot glue to the base of the felt flower. 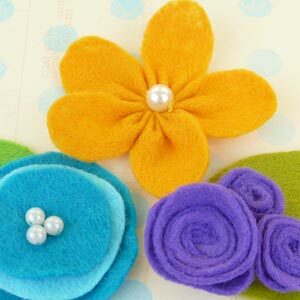 Cut a circle of felt just slightly smaller than your flower's base. Clasp it in between the baby hair clip's prongs and position it where you would like your flower to be attached. Cover the top of the felt circle and hair clip with hot glue and then firmly press down the flower onto this region to attach it securely in place. I've found that having the extra felt circle there really aids the attachment of the flower to the hair clip. When I glue the flower base directly to the ribbon it can be pulled off, and so this way the hot glue adheres to both felt and glue, and the flower is much more firmly stuck in place. And here is the finished baby hair clip. So pretty, such a gorgeous homemade baby gift idea. Why not make a set of them! I hope you enjoyed this tutorial! If you have any questions or comments, or just want to say hi, then please contact me with this handy form . 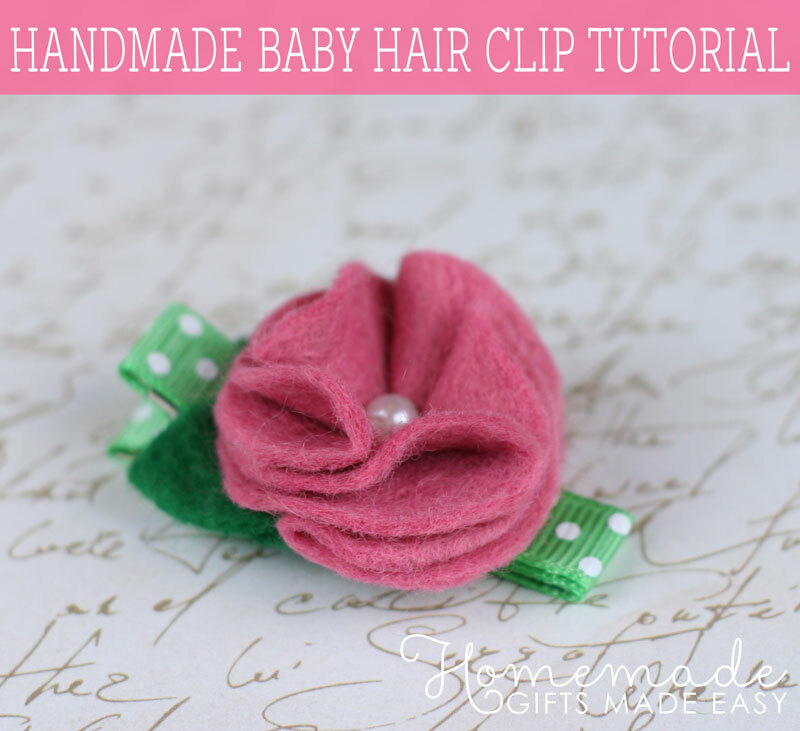 So now you've made your beautiful homemade baby hair clip you'll want to wrap it up nicely! 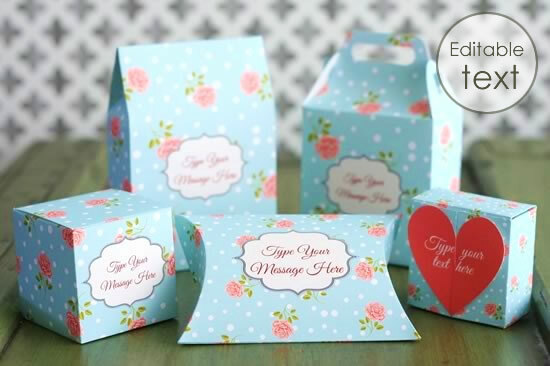 We've made some gorgeous printable gift box and bag templates which would be perfect for this little gift. They are super simple to download, edit and assemble at home. 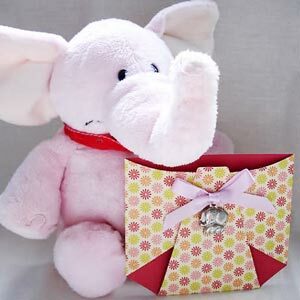 In 9 different patterns , they have editable labels so you can personalize your gift too!